Even with two kids in tow, I was still able to travel to 6 countries this year! People ask me if I'm very rich, well, of course not! We make it happen by prioritising our travels above other things. With a little planning and a lot of research, you too can save a significant amount of money on your travels! As usual, I've invited fellow mummy and daddy bloggers who love travelling to share their secrets to bringing their whole family (some as big as 6 people, with only one income) on vacations overseas (I've managed to include the daddy bloggers this time as dads are usually the ones paying for the trip!). 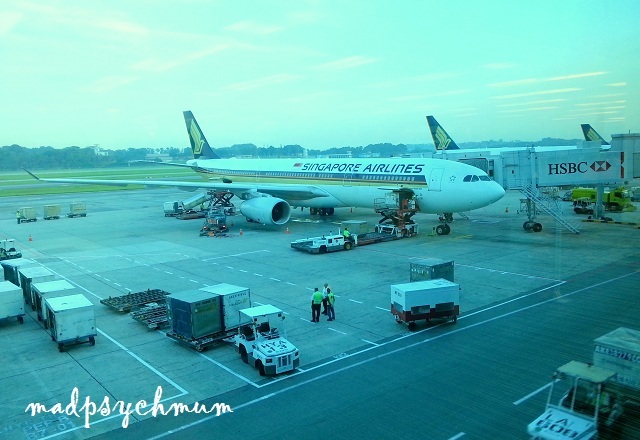 The hubby patrols the internet regularly waiting for Singapore Airlines (our favourite carrier) to release their promotions and when they do, that's when we snap them up!" "Fly on weekdays so that you can secure the best price for the tickets, especially if you are travelling on a budget carrier." Try to book flights mid-week instead of on Fridays to Sundays for cheaper rates. We have also been told prices deviate depending if you are using a Mac or PC to book. Clear your cache regularly as some websites capture your search results and adjust pricing upwards. It is best to book your flights at least 6 months in advance for greater savings. For flights shorter than 6 hours (e.g. to Taiwan, Phuket or Bali), we have flown with reputable budget airlines such as Jetstar and Scoot with much satisfaction. For longer flights (e.g. to Melbourne and New York City), we have flown with Middle-Eastern airlines such as Emirates and Qatar, which edge out our national carrier (Singapore Airlines) in terms of pricing, comfort and service." "Because our family is big, we always take budget airlines, especially when there are special promotions like 50% off or 1-for-1 sale which happens quite often. But that also means that you have to plan months ahead. Do note though, that any rescheduling is going to cost a lot more! If you have a few kids, buying the base 15kg or 20kg check-in luggage for everyone (including the kids) from the start might be cheaper than adding on 20kg or 30kg for just one individual." "Book your hotels through one website so that you can accumulate points. We usually book our hotels via Agoda using my credit card so that we can accumulate points for both and redeem our next hotel stay and vouchers respectively. We had gotten a number of hotel stays for free from all the points we had accumulated from all our hotel bookings." "Never forget to check out the hotel's main website for room booking promotions. Sometimes the price is even better than those on 3rd party sites such as Agoda and Hotels.com." Always compare the prices listed on the hotels’ own websites versus third party sites like 'Hotels.com' and 'Hotelclub.com' as you may chance upon seasonal promotions resulting in sizeable savings. ‘Hotels.com’ has a loyalty scheme where you'll get 1 free nights’ stay for every 10 nights’ booking. We are only 3 nights short of our 1st redemption. ‘Hotelclub.com’ occasionally has Visa promotions where they’ll take S$50 off your total bill if you book over the phone and tell them you are paying by Visa. ‘Hotelclub.com’ also gives members up to 7% back on our bookings, which we can use to offset the next stay. If possible, we try to book from sites which have a flexible cancellation policy to avoid incurring penalties should the travel plans change later. If you are celebrating a special occasion (e.g. birthday or wedding anniversary), request for a complimentary upgrade upon check-in. If the hotel is not running at full occupancy, the team will usually be happy to make your day. For longer stays (i.e. more than 3 nights) or in more expensive cities (e.g. New York and Australia), we will always book serviced apartments and homestays (try AirBnB) instead of hotels and channel the savings on accommodation to sight-seeing instead." "For us, our accommodation are usually sourced from AirBnB and we are happy with our choices to date. We had booked apartments in China, Hong Kong, Indonesia and Japan. The pricing is usually great and you get a taste of how the locals live!" "Families with more than 4 members normally need to book two rooms. We try to negotiate for extra beds and squeeze into one room. We also like to skip the breakfast package, preferring to research and eat like a local (cheaper meals, richer experiences)." While many hotels are offering better rates these days directly rather than through travel agents, sometimes agents have better package deals which might include meals and airport transfers. Once I've decided on a destination, I will usually do more research just to check what the agents are offering. Get yourself on the mailing lists or Facebook pages of airlines and hotel groups so that you know of the latest deals. Knowing the peak and off-peak seasons will help you predict when air fares and room rates will be at the lowest. Also, the weather used to be more predictable but these days with El Nino, you could end up having great weather in a low season and vice versa." "Buy your travel insurance a few weeks before or during the NATAS fair as various credit card and insurance companies often have special promotions and offer very good discounts. We almost always pay only 50% of the full price for insurance." "Purchase tickets for major attractions online to save money. Remember to bring the passport of your children to prove that they are below the minimum age so that they can get free entry." "For themepark and attractions, book your tickets online to enjoy savings, and avoid long queues." "Do your research and look up blogs and/or review sites to check out potential savings before heading to that place." "For Sydney, one high cost is car parking - and especially if you travel around the city area, the car park prices can be astronomical. If you do intend to travel to the city area, try weekends - where you can find a flat $10/day parking, or if you must drive, use "Book A Bay" under Wilson Parking to reserve a lot and get a better rate. For theme parks etc, buying tickets online is generally cheaper (as opposed to on the spot). You can try Living Social for some deals. I bought their Vivid Sydney cruise tickets from there before, and it was pretty enjoyable." "My kids love spaghetti, and can eat an adult portion of spaghetti per child. We use this trick in Singapore and places like Australia and other western countries. Most restaurants would allow you to order a spaghetti, and an extra portion of plain spaghetti noodles at just an extra $1 or $2. So we would pay full price for one plate of spaghetti, which usually comes with ample spaghetti sauce and we would just take approximately half of it to mix into the plain extra noodles. This way, we don't have to pay full price for 2 adult portions of spaghetti." "If you're travelling to a destination which is popular with Mainland China tourists, do check when the China Golden Week is, because they DO have 1 billion people. I learnt this the hard way!" "The best time to go travelling is when your kids have not started primary school education, because this means that you are able to holiday during non-peak periods where airfares and hotels will be at its cheapest! Please refer to my financial tips on planning family vacations for other tips." What are your money-saving secrets?